In the spring and autumn, when many get the urge to clean out their garage or attic, the road we live on looks like a miles long flea market, with all items priced at $0. That’s when the professional pickers come out in droves and help themselves. Within two days the area will appear fresh and clean, as though it had been thoroughly vacuumed by some giant housekeeper on a cleaning spree. At other times, if a household item is too good to throw in the trash, but not quite good enough to give to the Salvation Army or equivalent, it is set beside the trash can on collection day. There it becomes fair game for anyone driving by, as long as they can carry it away before the garbage truck arrives. The rest of the year, ‘Junque’ (pronounced Junk) is a game we play. When we find a charity can’t or won’t accept an item for various reasons, the neighborhood custom is to put it out a couple of days before garbage collection, then bet on how fast it will disappear. Last evening, we put a spring frame from a daybed plus a toy box by the side of the road. None of us thought the bed frame would go, but while our backs were momentarily turned, it disappeared without us ever hearing or seeing a vehicle. I made a bet the toy box would be gone within 20 minutes, Dale bet 15, and the couple next door took 30 and 60 minutes. The toy box vanished in 16. Dale’s prize, of course, was the pride of being closest to the correct time. Now who can say that country life is dull? And then there was the day I saw a neighbor, Choya, climbing down from his roof. 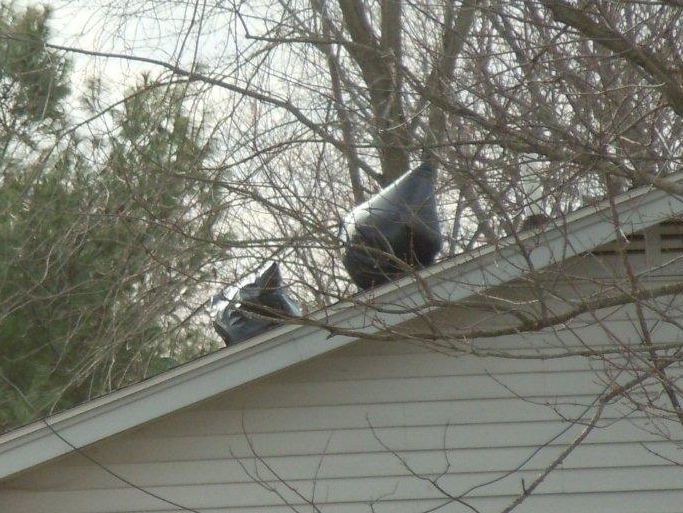 A movement drew my eyes to the roof’s peak where, flapping in the breeze, were two black trash bags. I assumed he was replacing a few shingles, but when the bags were still there a couple of weeks later I began to wonder if he’d found a unique place to hide gifts from his wife, Caroline. It was almost Christmas. I was fascinated as I watched those bags from my studio vantage point. They’d dance in the wind, teasing me with a wave and a sensuous shudder. So tempting. I wanted to know what goodies were inside. It was slow torture, but I refrained from calling Caroline and saying anything because I didn’t want to spoil a surprise. Instead, I appeased myself by snapping a photo and sent it to friends, asking for their guesses. Christmas came and went, and the bags were still on the roof. What was the matter with Choya, had he forgotten he put them there? I couldn’t stand it, it was killing me. So a few days after the New Year, I called Caroline and small talked awhile, then apologized for being so nosy but said I had to hear what was in those bags, overlooked Christmas gifts? (big sigh) Sometimes mysteries are better left unsolved.